Originally issued in 1992/93, a new round came out in 2005. BBE were so close to getting it right - and yet have completely missed the mark by pressing both sides at 33rpm and not 45rpm. Yes, I know that 7" singles that play at 33rpm exist - but these are most commonly EPs and contain three to four tracks. Such singles would always have a large label and small centre hole. All singles with large centre holes would play at 45rpm, as the large centre hole ensures that the record could be played in a jukebox, which can only play 45rpm. Funnily enough, that's why I bought this record myself - to play in my jukebox. A true Chicago classic! The Underground Goodies Mix is a true floor banger that still gets the crowd sweating 13 years after its release! Me and my brother Jason are Pussypower Productions and we were the first people to bring Cajmere to Europe when he DJed for us in Glasgow in the early 90's, and every time I hear this tune it reminds me of that amazing period. 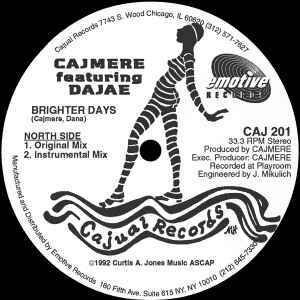 Cajmere is one of the true originals of House music and he's still pumping out the goods to this day ! Yeah, watch out people, the "underground goodie" is completely different to the "underground goodies remix", the latter can be found on the 2x12" Remixes or on DJ "Sneaks Back in the Box", which is recommended anyway!